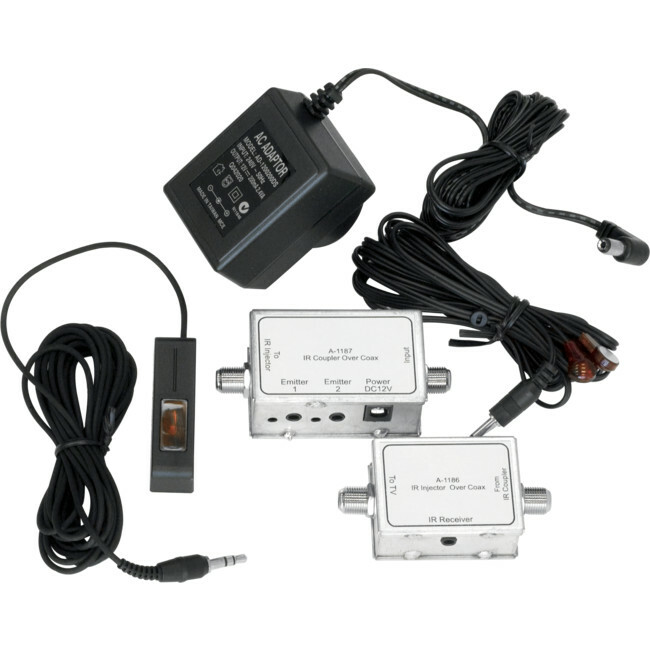 This kit allows IR signals to be inserted onto a coax cable in one location and extracted from coax on another location. We are all familiar with infra-red remote controls because we use them to operate our TV, DVD players etc. on a daily basis. However, you might not be familiar with "IR repeating." IR repeating allows you to control devices that are not with in the direct line of sight of your remote control. This kind of a system is commonly used in distributed audio/ video systems where the source components are centrally located, or when you wish to control your source devices remotely from an entirely different location. Does the IR target work with plasmas? Some plasmas are better shielded than others. In the one instance that we’ve tested the IR targets, it has worked without any issue. How come you need to buy "special" IR passing splitters when using this product? The special thing about IR passing splitters (eg Channel Plus branded splitters) is that they allow voltage to pass in both directions. Standard splitters, with their internal diode, only allow voltage to pass up the splitter. Since IR systems require this voltage to also be passed down the splitter also, you how to ensure that you choose the correct model.